A magical vision of beauty from the sea. 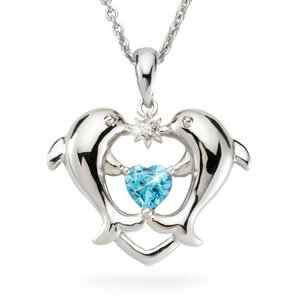 Shimmering silver dolphins leap above a sparkling ocean wave to form a perfect heart. 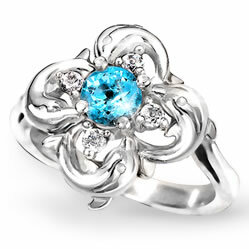 A precious Diamond glistens in the sun symbolizing this beautiful expression of love by award-winning artist Marjorie Andes. Accented with a delicate heart-shaped Blue Topaz, this new and original pendant with complementary chain is the perfect symbol for the beauty of love and harmony.